When you share a link on Twitter there are a number of services, like bit.ly, which allow you to track the impact of the url in terms of the number of clicks it attracts from other users. 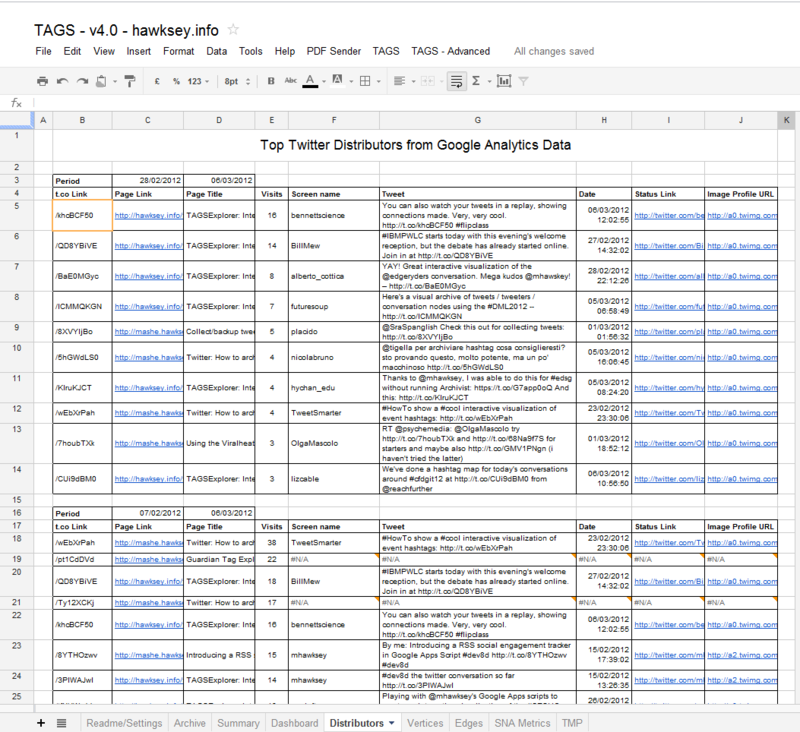 At the same time there are a number of ways to monitor people sharing links to your site, the most basic being using a Twitter search like this one for hawksey.info. Using these search results you could start extracting the follower information from the person tweeting, workout potential reach and so on, but wouldn’t you like to know, as with your own bit.ly account, how many visits someone else’s tweet generated to your site? Fortunately there is a way to do this and in this post I give you two tools to help you do it and look at why this information might be useful, but lets first look at how it is possible. In August 2011 Twitter started automatically wrapping links over 19 characters in it’s own shortening service t.co, later in October started wrapping all links in t.co. When you start navigating around the web at each page you visit the server generally knows which page you came from (exceptions include direct traffic and when coming from https://). When you click on a t.co link the site can track where you came from, known as referral traffic (interestingly it looks like Twitter also bypass your url shortener of choice by following the redirects until it reaches a final destination and use that link in the t.co redirect). So when you click on a t.co link posted on Twitter I can detect that, that’s where you came from. Furthermore, each time a person tweets a link it gets wrapped in a unique t.co url even if that url has been shortened before with the exception being new style retweets. 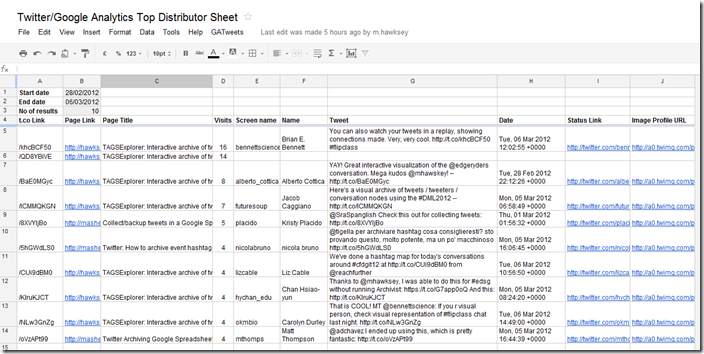 This means that when someone clicks on a link tweeted by someone I can trace it back to a single person. Lets see how this works in practice. 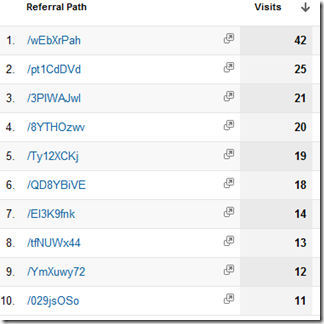 When I fire up my Google Analytics account and look at referral traffic I can see it’s dominated by t.co sources. 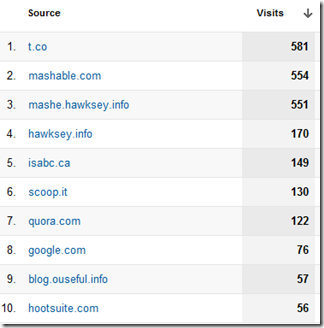 Drilling down into the t.co data I can actually see how many visits each t.co link generated. For some this isn’t news. In fact, Tom Critchlow was writing about how Twitter’s t.co link shortening service is game changing – here’s why way back in August 2011. His post probably has a better explanation of what is happening and also includes a bookmarklet (appears broken after recent Analytics overhaul) which takes the t.co referral path from your Google Analytics report and searches it on Twitter to find out which persons tweet is sending you the traffic. So big thanks go to Brian E. Bennett (@bennettscience) for generating 16 visits, Alberto Cottica (@alberto_cottica), @futuresoup and others for also generating traffic. But who generated the 14 visits? The reason this row is blank is while the link is still generating traffic to my site the link was first tweeted over 7 days ago meaning it is outwith the capabilities of the Twitter Search API. So by using a search term for your domain you can start collecting ten of thousands of tweets over months and years, which you then query against your Google Analytics data. ‘What the flip’ you might be asking. Here’s the explanation. By using the same search query at the beginning of this post for all tweets containing ‘hawksey.info’ (and because Twitter is wrapping everything in t.co it knows these even if they began life as a bit.ly or goo.gl) I can build up a corpus of tweets containing links to my site. If you also look at this archive I’m building you’ll see in the column labelled ‘text’ there is not a bit.ly or goo.gl in sight, all the links are t.co. 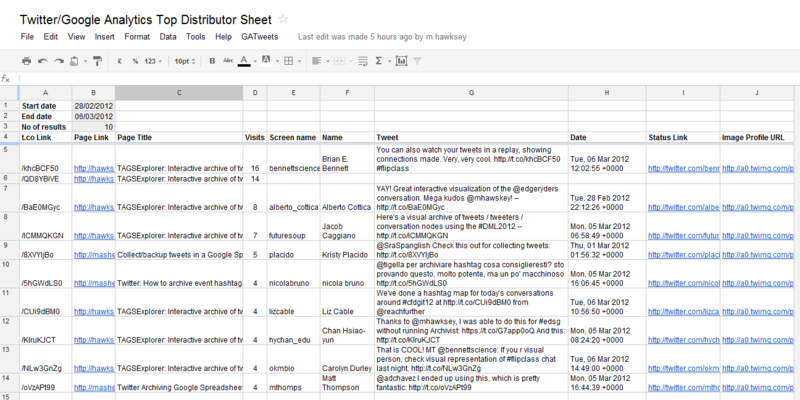 So all I need to do is extract a t.co referral path I’m interested in from my Google Analytics data and find who first tweeted it in my archive giving me the number of visits that link generated. Another thought was during the OER Visualisation project I discovered that social sharing of resources appears, insert caveats, to be rare. If you could recognising and reward the people pushing content it might encourage them to distribute more (and as I highlighted in How do I ‘like’ your course? The value of Facebook recommendation there is real and measureable value in people distributing information through their networks) – the flip side to this being as soon as you start measuring something someone else will start gaming the system. There’s also a degree of profiling you could do. If someone ends up at your resource having clicked on a linked shared by A that person may have something in common with them so you could target additional resources to them based on what A might like. I’m sure there are others. As I’ve shared the tools to do this it’s only fair that you share your ideas in the comments. I will leave you with one last thought. I haven’t mentioned much about the code, which is available and open source (my bits anyway) via the Script Editor. 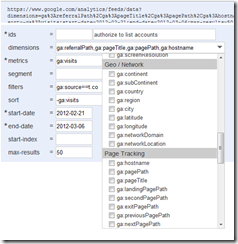 To help construct the Google Analytics query I used the Data Feed Query Explorer. Here’s a permalink to the main query structure I used. 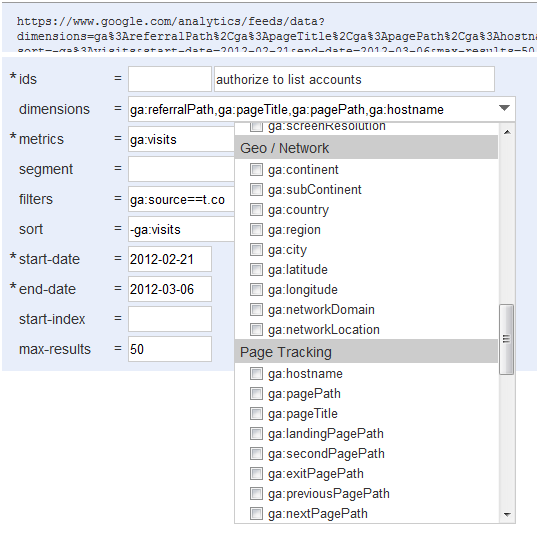 If you open the link and hit the ‘Authenticate with Google Analytics’ button choosing one of your own analytics ids you can see what data comes back. I’ve been conservative only pulling what I need but if you click on the ‘dimensions’ box you can see I could also be pulling where the visits were coming from, time of day, and more. All potentially valuable intelligence to give you a picture of how a resource is being shared if you can unlock it of course. Martin, what can I say…magic! BTW I got odd behaviour from GDocs when trying to run the scripts first time – I had to open the onOpen script in script editor and run it before GDocs ‘recognised’ any of the other scripts. All running fine now though .Thanks! Thanks Jaspal. Surprised social media metric sites haven’t picked up on this yet. Postrank already have authorised access to my GA account, so they have access to the data they just need to glue together. This is marvellous. 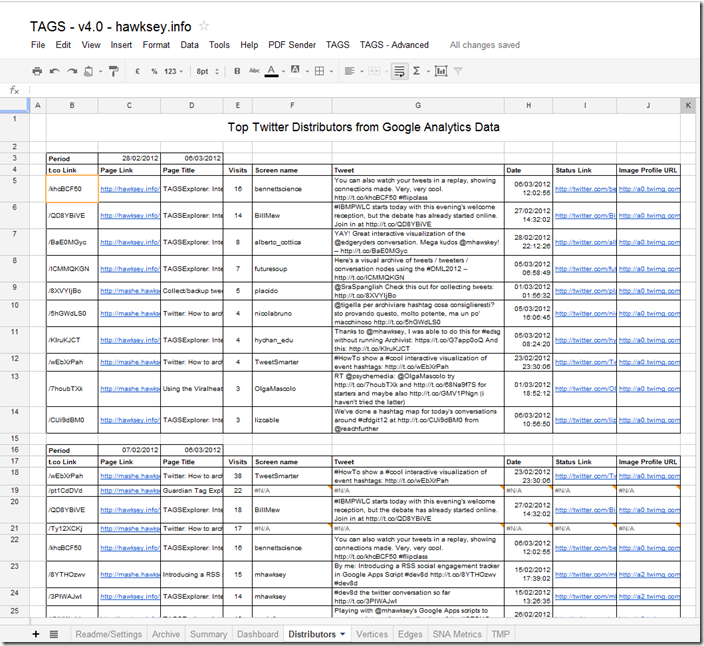 I’ve been using your TAGS template after finding that ‘Twapperkeeper’ (awful name) was being bought out by Hootsuite and would be a paid for service, and as you know your advice has helped us sort out ArchitectMap too. As a complete novice to coding and scripts (though enthusiastic!) I shall take a look and see if I can make this work for me. My motivation is thanking people on twitter who help you, and helping them help you more. Finding helpful people on twitter is one of my hobbies! Really cool stuff, thanks! Will for sure give it a try, no doubt it will be useful. On a related side-note; when using earlier versions of the TAGS spreadsheets, for popular tags, I run into issues when the spreadsheet gets too large. both when the “number of cells”-limit is reached (of course), but also (as it seems) when you get a large spreadsheet, but still with space left. Have you noticed this from your end? Any ideas of good workarounds? Something I keep meaning to do but have never got round to doing is pushing the data into Google Fusion Tables which is possible with Apps Script. The GA-authentication (and connection to specific profile) seems to have gone well though. Not sure where to start trouble-shooting, any quick hints? I just did a test on this: I think t.co urls map onto unique (user,url) pairs for original tweets/link sharing (not sure what happens if I RT someone and cut/replace an original link? I suspect my new t.co link will be used? ), so if I tweet a link to hawksey.info, or a bitly shorturl to hawksey.info, they will receive different t.co links. yes Twitter appears to follow redirects and records the destination (which doesn’t appear to be publicly accessible via the api), the t.co then points to the to the url submitted by the user. Something I hadn’t noticed until now is in the entities data returned (example below) it would be easy for a twitter client to replace a t.co with the original link. I’m not aware of any clients doing this and I imagine if twitter found out they would be shutting their api access sharpish. for some reason the google docs files are only opened on view only mode. I downloaded and uploded the file again to my google docs , so it is working, but I the meny items “TAGS” are not showing and there light blue button is non exist as well. be glad if you can assist.